On Friday last week (that is the 4th of May 2012 just in case you are reading this in 2013) we spent an excellent day up in the BBC’s plush new MediaCity, Salford offices with a bunch of BBC folk, other start-ups and generally bright, vibrant people. 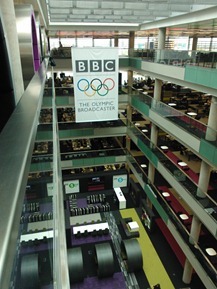 The cause was the first instalment of the BBC’s Connected Studio. First, a little about what the Connected Studio is and then I’ll tell you some more about the day. BBC R&D are looking at innovation all the time with the real possibility that some of the very cool new tech they are currently working on not surfacing for another 10 to 20 years.The Connected Studio is an initiative to look at how the BBC can innovate just a little beyond the existing roadmap for digital. The intention is to do this in a collaborative manner with BBC staff working with invited external digital agencies, technology start-ups, designers and developers to participate in generating new ideas, concepts, features and functions . Find out more here. 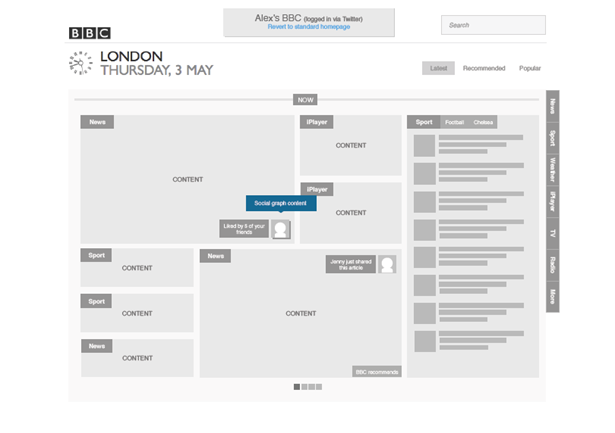 The main focus areas each having their own creative studio days are 1) Homepage, Search and Navigation 2) Weather and Travel 3) BBC Children’s and 4) The Olympics. There is a reasonably detailed engagement charter detailing the steps to achieve the goal of generating ideas and moving them rapidly through concept to proof-of-concept to pilot. Each focus area will start with a Creative Studio day. This is a one day event (the first being 4th May. More on that later…) to facilitate ideas and concepts. Out of the ideas pitched at the end of the day, a number of the companies or individuals will be invited back to the Build Studio. The build studio is a 2 day innovation workshop to develop ideas and proof-of concepts much like a Launch 48 (although you already have the concept by this point). The objective is to have a working PoC at the end of the 2 days. Of these PoCs, up to five will be invited to work on a 6-8 week Pilot Build for which there will be up to a £50K budget. The BBC then has an exclusive option for a 6-12 month period to take forward any successful pilot it chooses for full product development. There is a total fund of £1m to develop concepts throughout the year, with an additional £1m of BBC staff time. That was a quick overview of the overall concept of The Connected Studio I’ll take you through the experience of participating in the first Creative Studio. We were limited to 2 attendees, as I believe was every other company. So I attended along with one of the UX Consultant’s in our network Alex Ng. The Creative Studio on 4th May was all about Homepage, Search and Navigation. Prior to the day we had been provided with a creative brief so knew that the focus was to explore the potential uses of customisation and personalisation. You have the option of booking in advance, a 15 minute closed pitch with the BBC and a third party. This is for those that already have a developed idea and want to protect their IP. Everyone else presents in an open session, the time you have to present largely depending on the number of people presenting. Arriving at MediaCity between 9-10 for registration (I left my house at just after 5am) you get a good breakfast before getting started at 10. 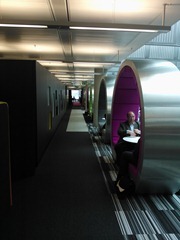 The new BBC Office has lots of space that has been built to foster collaboration and creativity. We were situated in an events space that had been segregated into a number of areas for the main presentations, break out areas for collaboration and another presentation area for some presentations by some key BBC experts that were open to all if they chose to attend. Adrian Woolard (Project Lead R&D North Lab) got the day started, introducing us (probably about 60-70 people half of which were the BBC) to what the Connected Studio is, the vision unveiled by Raph Rivera and what was expected of us. James Thornett and Clare Hudson then introduced us to the current homepage and it’s journey to now, their strategic objectives and the challenges they face. At 10:40 we were ready to go and had a 4pm deadline to be ready for the presentations. We had developed a few ideas into one concept on the train up to Manchester so requested a closed pitch on the day but they were full. So, it turned out soon after that we had a 2 minute slot to present in the open session in front of the audience and the camera. Not nerve racking at all! As we already had an idea we went off into our own little space to develop it further, prepare wireframes and a presentation to fit into the 2 minute time slot. Other people gathered around the “ideas wall” to collaborate with others who up to now, had only half an idea and wanted to create a team to work up some ideas on the day. Others went to speakers corner where various BBC experts were waiting to answer any questions. I didn’t attend all of the morning sessions as I was deep into developing our idea but both the Homepage Tech session and the Personalisation session were very useful. Both gave an insight into the current state of their topics plus a view of the roadmap ahead. Especially interesting was Tom Broughton discussing their ambitions to implement a Triplestore to allow semantic search features – something that was prevalent in the idea we were presenting. A very nice free lunch was available from Midday and then the afternoon session was focussed around developing the presentations whilst those that had closed pitch sessions were presenting in a private meeting room. Linda Cockburn, a creativity consultant that led the BBC’s Creative Network for 5 years, did a presentation on how to present and then there was an opportunity to present your pitch back to her and real members of the Homepage audience to get personalised feedback prior to the 4pm deadline. At 4pm we were all ushered to the presentation area where a number of plasmas, a microphone and a cameraman awaited. There were twenty-three 2 minute presentations. The whole day (as expected from the BBC) was run to strict timelines, the excellent event production team running a tight ship for everyone involved including the 15 minute morning expert sessions. So, the pressure was on to fit our presentations into the 2 minutes, some of which were cut off because they ran out of time. All-in-all there was a high quality calibre of presentations with some excellent and varied ideas produced. Some were digital but to my surprise most were hand drawn presentations on flip-board paper and there was one presentation told in the form of a story. Without doing too much of a reveal, our concept was based around turning the home page into a living thing that is more dynamic and more real-time rather than a navigation step that users spend very little time on. Less than 10% of people used the personalisation features in the previous version of the homepage and lots of people will continue to ignore it. With this is mind we introduced various levels of personalisation and testing the idea of machine learning to automate personalisation as much as possible. Once a semantic Triplestore is introduced, this could be taken a lot further. I doubt we will pitch for Weather and Travel or BB Children’s creative studios due to this being less relevant to the work we do but you never know. If they interest you though, I would highly recommend getting involved in The Connected Studio whether you are a digital agency, tech firm or and individual designer or developer. It really is an excellent day.